A crispy Italian bread loaf stuffed with pepperoni and cheese with an Italian herbs Parmesan butter. Baked until crispy and cheese melts, served with warm marinara! 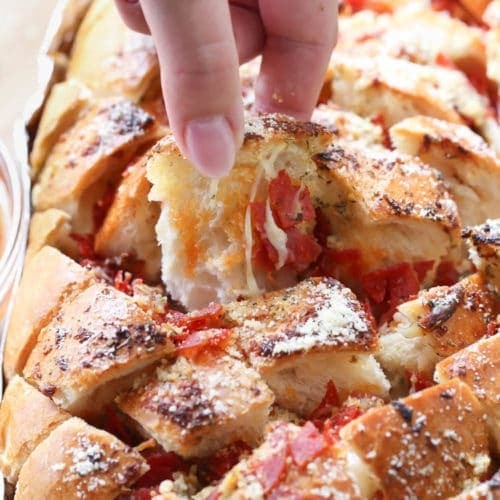 This Pull Apart Pizza Bread is the perfect easy appetizer for parties or for the kids after school. 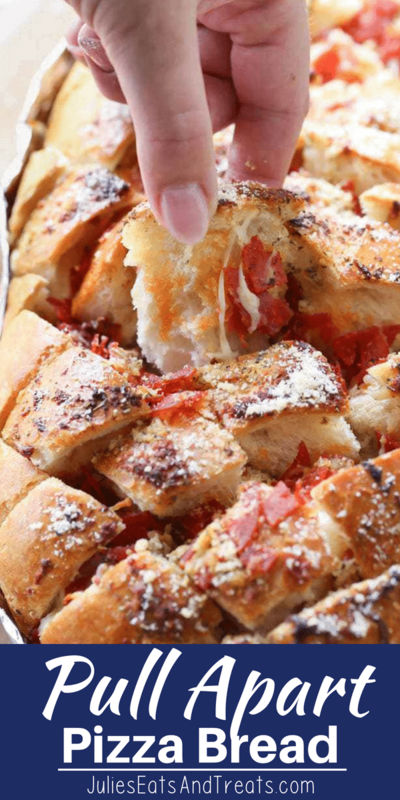 This pull-apart pepperoni bread is the perfect easy appetizer to serve for parties or even for a quick lunch for kids. It’s so fun to make and has the taste of a pepperoni pizza – minus the hassle of making it. This easy bread has a prep time of like 10 minutes and a bake time of about 15. 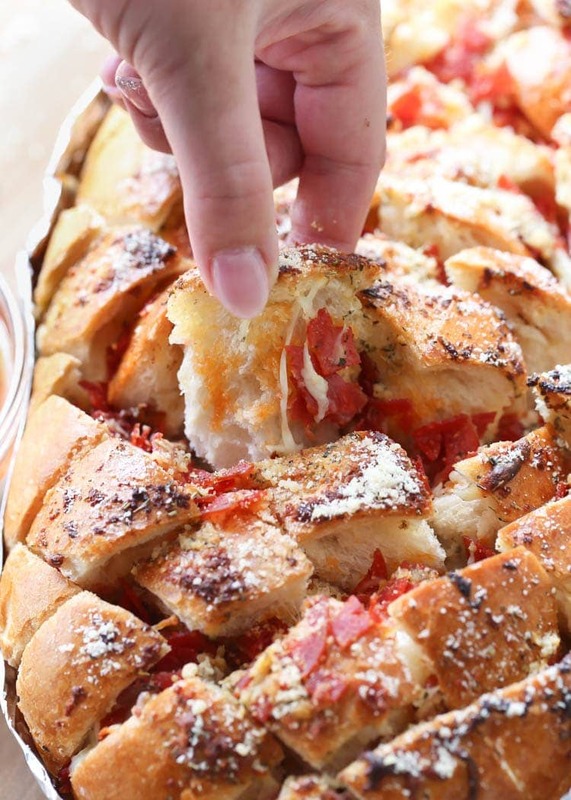 That’s a total of only 25 minutes until you are enjoying Pull Apart Pizza Bread! 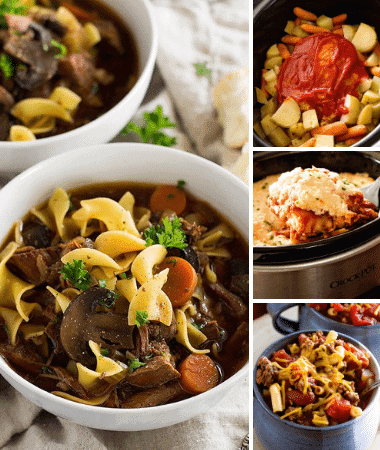 Winner recipe. 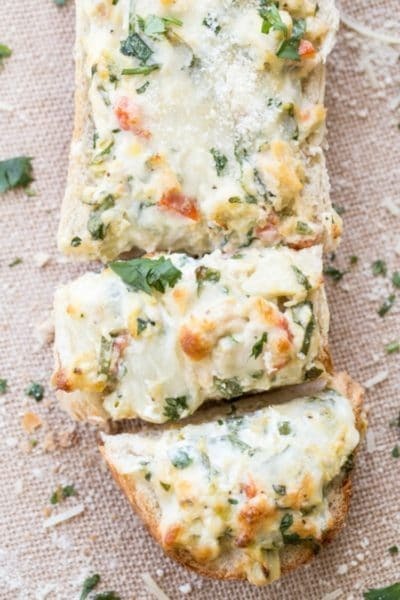 I love the added flavor the garlic butter Parmesan mixture gives the bread. 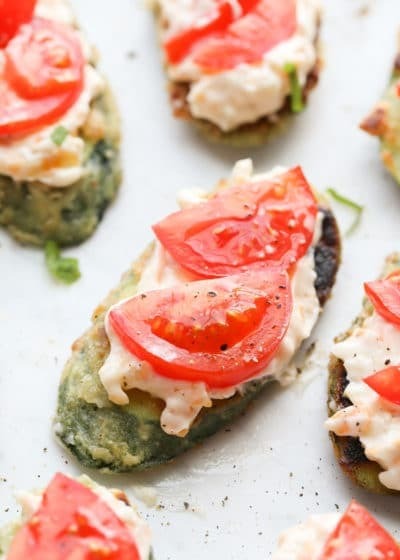 It gives it a crispy crunch and adds so much flavor. I adore anything with garlic, in fact I usually double the garlic in every recipe. You want to use a traditional marinara (pasta) sauce served as a dipping sauce. I just add the sauce to a small saucepan and heat it right before I take out the bread loaf from the oven. 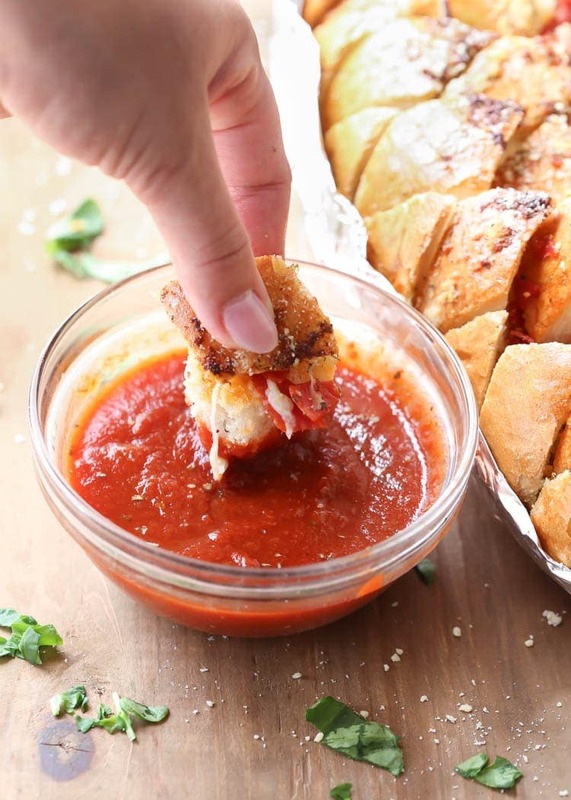 Dipping the pepperoni cheesy bread into warm marinara is SOO delicious. If you don’t like warm pizza sauce, you can serve it cold. I made this for an appetizer at a party the other night and both the adults and kids devoured it. I love the fact that you can ever make a couple of these pull apart loaves and stuff them with whatever toppings you like. 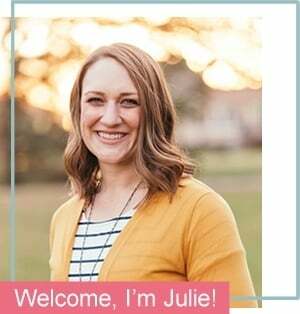 One can be more adult friendly and one can be more kid friendly! What cheese can I use? 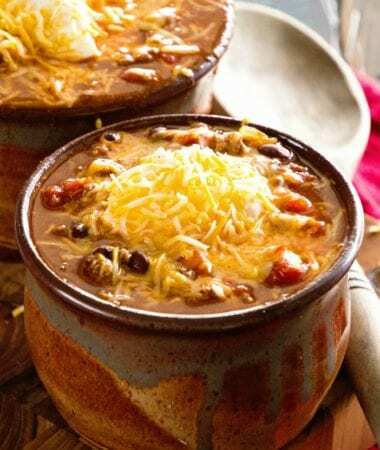 Bottom line, you can use any favorite cheese you have! I typically use Mozzarella. However, four cheese, baby swiss or provolone may be used. You can either grate the cheese or cut into thin slices. 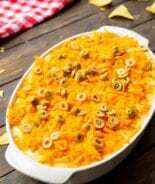 Don’t use the pre-shredded cheese if you can avoid it. It won’t get as ooey gooey and we want the ooey gooey factor! Our kids love pizza. 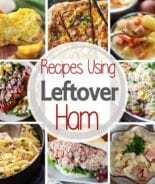 So, they love any recipe that is a reminder of how much they love pizza, ha! 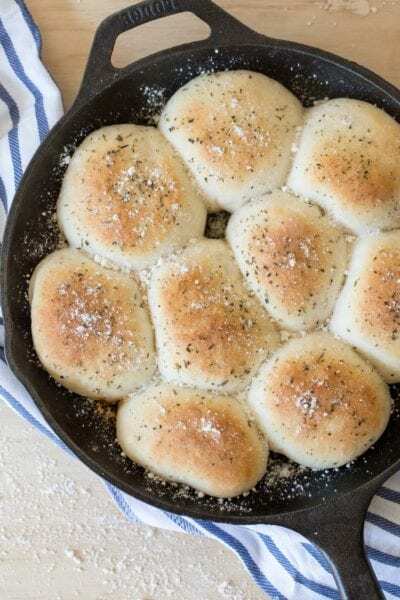 We often make baguette pizza bites and Pizza Monkey Bread that is where the inspiration for this recipe came from. We also love making pizza quesadilla. Just use flour tortillas, add pepperoni slices, marinara and cheese and cook on a skillet. 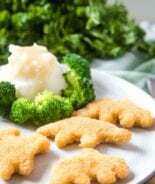 They’re our go-to after school food, it’s so easy to make and so delicious. 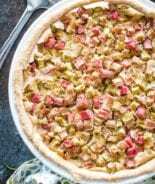 Our 3-meat pizza ring is also so popular with the pizza lovers! You’re looking for a large loaf with substance – crusty bread – because you’re going to stuff it full of all kinds of cheesy, ooey, gooey goodness! 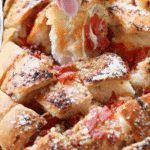 How do you slice the loaf for Pizza Bread? When you slice the bread, be sure not to cut all the way thru. It really helps to place a pair of chopsticks on either side of the loaf, because this will keep you from cutting the bread in half. Slice first diagonally one way, then turn it ninety degrees and slice the second way – again paying attention to not cut thru the loaf of bread. Take a few pieces of foil about the side of the bread loaf and create a boat to place the loaf into it. This will keep the loaf from breaking apart and all the pieces in place. Prepare the garlic Parmesan butter mixture. Cube pepperoni slices into small pieces. Pour Parmesan butter mixture over cheese and pepperoni slices. More great pull-apart bread recipes! Place the bread loaf on foil. With a bread knife slice the bread loaf into cubes, not going all the way through. Stuff cheese and pepperoni slices in the creases. Bake at 365 for 15 minutes. Serve when hot with marinara sauce. Just made this. It was a HUGE hit!!!! Kids asked to make it next week again. Thanks for the recipe. So glad you enjoyed it Sue!! I would eat the whole thing. This would be super hard for me to share. This looks so addicting and dangerous, LOL! Can’t wait to try it!! What a delicious recipe. 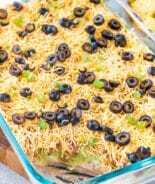 My hubby was looking over my shoulder and said I need to make it asap. Your hubby is a smart man! 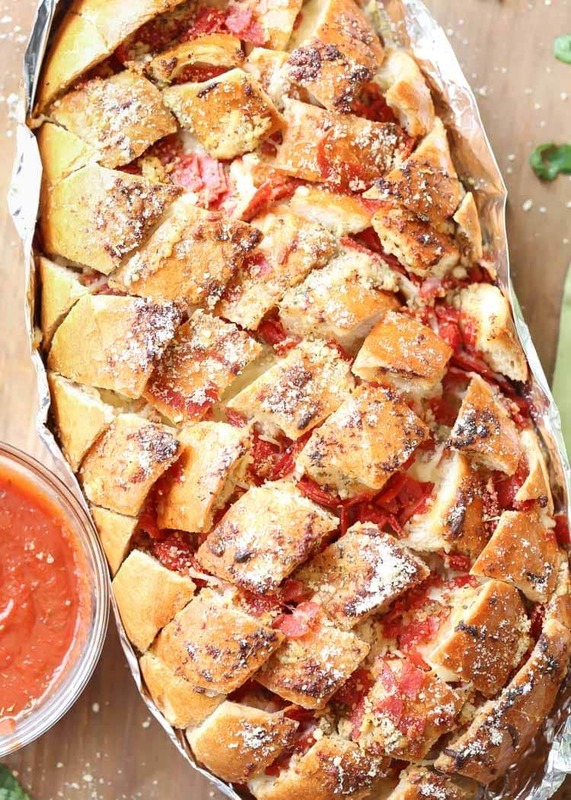 I made this pizza bread this past weekend for a party and it was DEVOURED in no time! Will definitely make it again! I wouldn’t recommend it as it’s best served hot!